I'm trying to look on the positive side. Not that there is much of that, I agree. I think this upcoming Anniversary is going to be a little bittersweet because all this time shipping them and nothing's really changed. In fact, it's gone a little bit backwards. or would EVER do this! What bugs me more than anything, is they have no time together. Not even a smidge of quiet affection between them. Janine didn't mention Egon when she was deliberating her job prospects with Jenny. They were shuffled onto separate teams so that took away any chance of them speaking to each other, or witnessing what each other had gone through. 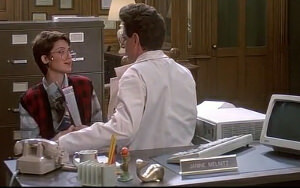 When Egon injured his leg, and Janine didn't seem concerned about him at all. But when Peter's in hospital she's at his bedside. As a shipper, I'm looking for clues that they like each other but there doesn't seem to be much put out there now for me to try to find. In a weird way, I like that Janine seems to be slowly moving on. Makes me feel like doing the same. Egon's barely interesting to me right now. It feels like Holtzmann out-weirded him and he hasn't been the same since. I agree that Janine seems cranky all the time, which is a bit irritating, as well. I feel like they are both kind of at a dead end, and maybe Janine not being around so much from now on because of her new job is a sign of it. Maybe they've taken her character as far as they can, and have just decided to bring her in only very occasionally from now on. I don't know. It does seem a bit bleak. The positives seem to be that at least the other characters seem to know they like each other, even if Egon and Janine don't seem to realise it themselves. I don't know if that's a good thing, but it's something I guess. And the gris-gris hasn't been used yet, though I doubt it'll be used in the way I and probably most other people on here would like it to be used - as a ways and means of bringing these two together. I'm getting to the stage where it seems a bit fruitless to keep on hoping for something that, in all likelihood won't ever happen. Or if it does, it'll be years from now and do I really want to keep on with this if the one major thing I love about ghostbusters is missing? The quality of the comics are fantastic, the storylines are engaging, the attention to detail is superb and the artwork and colouring is amazing. The only thing I had a real issue with was the frequency of the crossovers and the overwhelming number of characters competing for space, but frankly I can put up with that. If there were something positive I could find in the Egon and Janine relationship that would keep me as a shipper interested, then it would be perfect. Last edited by nikki on November 25th, 2018, 9:22 am, edited 1 time in total. Also, if Egon can write subliminal messages to erase people's minds, and knows how she feels, and doesn't plan to do anything about it, then why doesn't he do her a favor and make her forget her feelings toward him?! He's being an A-hole. Prime Egon is an A-hole. And can I say EGB Egon is my favorite Egon in the series! He's nice, he's happy, he's less uptight. 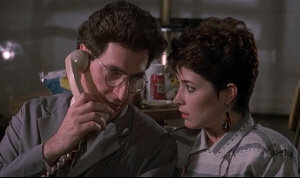 This Egon is totally with Janine, it's obvious, it's helped him . I want to know how Prime Egon got from the way he was in GB1 to the way he is now. I feel like his relationship with Janine back in GB1 helped to humanise him, but without that relationship to play off in the IDW comics he's just become another Spock-like character. Oops. I think I just answered my own question, there.